You have taken a nice photograph of an ancient monument and now you want to enlarge the size of your photograph from its original one. In the process of enlargement, it is ensured that the shape of the photograph remains the same from the original one, only the size differs. The size changes but the shape remains the same. By now, you have some cue about similarity. Similar figures are geometrical figures, which have the same shape but not the same size. In your previous chapter, you studied about congruent figures. It is important to understand the difference between congruency and similarity. Â The two congruent figures have the same shape and size so that one can be superimposed on the other to cover it exactly and completely. However, in a pair of similar figures, the corresponding sides are in proportion but not equal. From the discussion, we can conclude that congruent figures are similar but similar figures are not congruent. their corresponding sides are in same ratio. 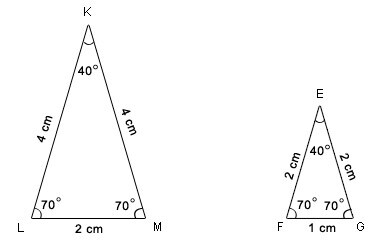 It is important to note that, as in the case of congruency, similar triangles also should be written in the correct correspondence of their vertices i.e it would be incorrect to write triangle KLM is similar to triangle GFE. It is important to note that if one polygon is similar to a second polygon and second polygon is similar to a third then the first polygon is also similar to the third polygon. In similar figures since the corresponding angles are equal and the corresponding side are in the same ratio, if a side of a polygon is missing, we can find out using the ratio called proportion. Not only are the corresponding angles the same size in similar polygons, but also the sides are proportional. We can use the ratios to help the find missing values. In the above figures, the measures of other lengths are given and we are supposed to find out the measure of segment MN. The length of MN can be found through proportion. After substituting the values of the segment lengths, we get this proportion. See how well you understand the material – try our Similar Figures Test.